For some reason, the system crashes when I export. I have the most recent update. Please advise. Could you let us know your iPad model and iOS version? We'll make sure to have it fixed by the next update. @dondi Thanks for the info. Your issue may be one of several export bugs from 4.x that have been fixed for the next update. 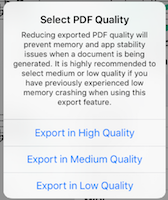 This includes a very general bug where the app freezes or returns to the Home Screen when attempting to export from the Score Window, which occurred in any export format and iOS 9 version.